Donovan (Donovan Phillips Leitch, born 10 May 1946, in Maryhill, Glasgow), is a British singer-songwriter and guitarist. Emerging from the British folk scene, he developed an eclectic and distinctive style that blended folk, jazz, pop, psychedelia, and world music. Donovan came to fame in the United Kingdom in early 1965 with a series of live performances on the pop TV series, Ready Steady Go!, and his popularity spread to the US and other countries. After signing with the British label, Pye Records in 1965, he recorded a handful of singles and two albums in the folk music vein. After extricating himself from his original management contract, he began a long and successful collaboration with leading independent record producer Mickie Most, scoring a string of hits in the UK, the US, Australia and other countries, including several British and American #1 hits and million-selling records. Donovan was the first artist to be signed to CBS/Epic Records by then-new Administrative Vice President Clive Davis, who later became head of the CBS Record empire. Donovan was one of the leading British recording artists of his day. He produced a series of hit albums and singles between 1965 and 1970. He became a friend of leading pop musicians including Joan Baez, Brian Jones, Bruce Springsteen, and The Beatles. He influenced both John Lennon and Paul McCartney when he taught them his finger-picking guitar style in 1968. Donovan’s commercial fortunes waned after he parted ways with Mickie Most in 1969, and he left the music industry for a time. He continued to perform and record sporadically in the 1970s and 1980s, but gradually fell from favour. His gentle musical style and hippie image was scorned by critics, especially after the advent of punk rock. Donovan withdrew from performing and recording several times during his career, but he underwent a revival in the 1990s with the emergence of the rave scene in Britain. Late in the decade, he recorded the 1996 album Sutras with producer and long-time fan Rick Rubin and released a new album, Beat Cafe, in 2004. Donovan contracted polio as a child and the disease, and subsequent treatment, left him with a limp. In 1956, his family moved to Little Berkhamsted near Hertford, England. Influenced by his family’s love for Scottish and English folk music, he began playing guitar at 14. He enrolled in art school but dropped out soon afterwards, determined to live out his beatnik aspirations by going out on the road. In 1963, he took a trip to St Ives with Gypsy Dave and other friends from Hertfordshire. Returning to Hatfield, he spent several months playing in local clubs, absorbing the music of the British folk scene around his home in St Albans, learning the crosspicking guitar technique from such local players as Mac MacLeod and Mick Softley and writing his first songs. In 1964, he travelled to Manchester with Gypsy Dave, then spent the summer in Torquay, Devon. In Torquay he stayed with his old friend and guitar mentor from St Albans, Mac MacLeod, and took up busking (street performing), studying guitar, and learning traditional folk and blues songs. While recording the demo, Donovan befriended Brian Jones of The Rolling Stones, who was recording in a nearby studio. Coincidentally, he had also recently met Jones’s ex-girlfriend Linda Lawrence, they became close friends. The meeting between Linda and Donovan was pivotal as they began an on-off romantic relationship for the next five years. She exerted a huge influence on Donovan’s music but refused to marry him and moved to the US for several years in the late 1960s but eventually did marry him on October, 2nd 1970 at Windsor Registry Office. Although he had other relationships—one of which resulted in the birth of his first two children, Donovan Leitch, Jr., and Ione Skye Leitch—he remained strongly drawn to Linda, and she became his muse. His confused feelings about her inspired dozens of songs, including “Legend Of A Girl Child Linda”, “Sunshine Superman” and many others. Of course, when Donovan met him he was very excited and decided to play something for him. 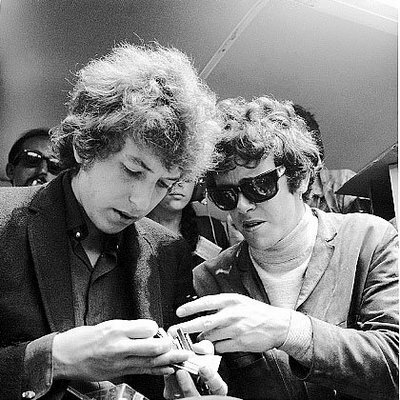 Dylan said he liked Catch The Wind, but Donovan said, I’ve written a new song I wanna play for you. So he played a song called My Darling Tangerine Eyes. And it was to the tune of Mr Tambourine Man! And Dylan was sitting there with this funny look on his face, listening to Mr Tambourine Man with these really weird words, trying to keep a straight face. Then Dylan says, Well, you know, that tune … I have to admit that I haven’t written all the tunes I’m credited with but that happens to be one that I did write! I’m sure Donovan never played the song again! The one who really taught us to play and learn all the traditional songs was Martin Carthy—who incidentally was contacted by Dylan when Bob first came to the UK. Bob was influenced, as all American folk artists are, by the Celtic music of Ireland, Scotland and England. But in 1962 we folk Brits were also being influenced by some folk Blues and the American folk-exponents of our Celtic Heritage…Dylan appeared after Woodie [Guthrie], Pete [Seeger] and Joanie [Baez] had conquered our hearts, and he sounded like a cowboy at first but I knew where he got his stuff—it was Woodie at first, then it was Jack Kerouac and the stream-of-consciousness poetry which moved him along. But when I heard Blowing In The Wind it was the clarion call to the new generation – and we artists were encouraged to be as brave in writing our thoughts in music…We were not captured by his influence, we were encouraged to mimic him—and remember every British band from the Stones to the Beatles were copying note for note, lick for lick, all the American pop and blues artists—this is the way young artists learn. There’s no shame in mimicking a hero or two—it flexes the creative muscles and tones the quality of our composition and technique. It was not only Dylan who influenced us—for me he was a spearhead into protest, and we all had a go at his style. I sounded like him for five minutes—others made a career of his sound. Like troubadours, Bob and I can write about any facet of the human condition. To be compared was natural, but I am not a copyist. In late 1965, Donovan split with his original management and signed with Ashley Kozak, who was working for Brian Epstein’s NEMS Enterprises. Kozak introduced Donovan to American impresario Allen Klein (who would later take over management of The Rolling Stones and The Beatles). Klein in turn introduced Donovan to producer Mickie Most, who was riding high on the success of his chart-topping productions with The Animals, Lulu, and Herman’s Hermits. Mickie Most was the nominal producer of all Donovan’s recordings in this period, although Donovan asserts in his autobiography that some of the recordings were self-produced, with little or no input from Most. Their collaboration produced a string of successful singles and albums, recorded with leading London session players including Big Jim Sullivan, Jack Bruce, Danny Thompson and future Led Zeppelin members John Paul Jones and Jimmy Page. Many of Donovan’s late Sixties recordings featured a core group of musicians who regularly recorded and/or toured with him, including his key musical collaborator John Cameron on piano, Danny Thompson (from Pentangle) or Spike Heatley on upright bass, Tony Carr on drums and congas and Harold McNair on saxophone and flute. Carr’s conga style and McNair’s distinctive flute playing are an intrinsic feature of many of these recordings. Cameron, McNair and Carr also accompanied Donovan on several major concert tours and can be heard on his 1968 live album Donovan In Concert.